Newton IM (of BNY Mellon) are seeking an experienced agile leader / developer to spearhead the design & delivery of their key front office investment platform. Hands-on development role - delivering high quality technical solutions with emphasis on automation and continuous integration - as well as offering coaching style leadership aimed at motivated and empowering this small, dynamic agile delivery team. Professional, friendly and collegiate environment, offering competitive benefits package. 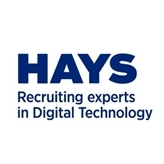 Want to get notified about new jobs at Hays plc?